INCLUDES: (1) Maintenance ReamerFEATURES: High speed steel Left hand helix Right hand cut Flatted round shank Collar stop De-bur holes Enlarge existing holesSPECIFICATIONS: Size: 3/4" Decimal equivalent: .7500 Point diameter: .453 Flute length: 4-15/16" Overall length: 7" Recommended for light steel erection, automotive frame work, truck and trailer and farm machinery.Champion's SA80 Maintenance Reamers are the ideal maintenance and repair tool that cuts steel, stainless steel, and tough alloys. They quickly de-bur welded and punched holes and enlarge existing holes. Used widely for light steel erection, automotive frame work, truck and trailer and farm machinery. INCLUDES: (1) Maintenance ReamerFEATURES: High speed steel Left hand helix Right hand cut Flatted round shank Collar stop De-bur holes Enlarge existing holesSPECIFICATIONS: Size: 5/8" Decimal equivalent: .6250 Point diameter: .259 Flute length: 4-1/2" Overall length: 6-9/16" Recommended for light steel erection, automotive frame work, truck and trailer and farm machinery.Champion's SA80 Maintenance Reamers are the ideal maintenance and repair tool that cuts steel, stainless steel, and tough alloys. They quickly de-bur welded and punched holes and enlarge existing holes. Used widely for light steel erection, automotive frame work, truck and trailer and farm machinery. Machine reamer is used to ream workpieces that have been drilling hole, mainly to improve the precision of hole and reduce its surface roughness. With many blades, machine reamer cuts and removes the thin layer metal on hole surface that has been processed. After the processing of a reamer, machining hole size and shape can be precise. Due to the light and screen difference, the item's color may be slightly different from the pictures. Please allow 1-3cm differences due to manual measurement. Thank you for your kindly understanding. 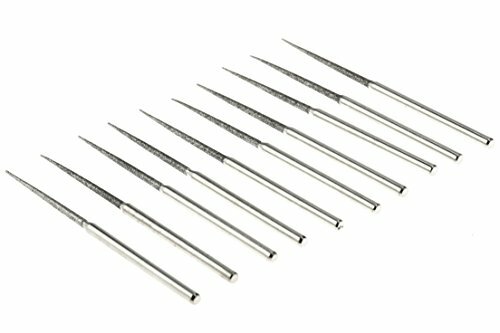 Made of high speed steel, these reamers have high hardness and durability. Fractional carbon steel plug taps offer precision cut threads, accurately formed for consistent. Sharp cutting-edge, high cutting ability, high accuracy, long service life. Widely used for bore machining, installed in drilling machine, milling machine, etc. Processed surface of iron, wood, copper, aluminum and other soft materials. INCLUDES: (1) Maintenance ReamerFEATURES: High speed steel Left hand helix Right hand cut Flatted round shank Collar stop De-bur holes Enlarge existing holesSPECIFICATIONS: Size: 7/8" Decimal equivalent: .8750 Point diameter: .580 Flute length: 5-3/16" Overall length: 7-1/4" Recommended for light steel erection, automotive frame work, truck and trailer and farm machinery.Champion's SA80 Maintenance Reamers are the ideal maintenance and repair tool that cuts steel, stainless steel, and tough alloys. They quickly de-bur welded and punched holes and enlarge existing holes. Used widely for light steel erection, automotive frame work, truck and trailer and farm machinery. INCLUDES: (1) Maintenance ReamerFEATURES: High speed steel Left hand helix Right hand cut Flatted round shank Collar stop De-bur holes Enlarge existing holesSPECIFICATIONS: Size: 9/16" Decimal equivalent: .5625 Point diameter: .2925 Flute length: 3-15/16" Overall length: 5-15/16" Recommended for light steel erection, automotive frame work, truck and trailer and farm machinery.Champion's SA80 Maintenance Reamers are the ideal maintenance and repair tool that cuts steel, stainless steel, and tough alloys. They quickly de-bur welded and punched holes and enlarge existing holes. Used widely for light steel erection, automotive frame work, truck and trailer and farm machinery. INCLUDES: (1) Maintenance ReamerFEATURES: High speed steel Left hand helix Right hand cut Flatted round shank Collar stop De-bur holes Enlarge existing holesSPECIFICATIONS: Size: 13/16" Decimal equivalent: .8125 Point diameter: .5155 Flute length: 4-15/16" Overall length: 7" Recommended for light steel erection, automotive frame work, truck and trailer and farm machinery.Champion's SA80 Maintenance Reamers are the ideal maintenance and repair tool that cuts steel, stainless steel, and tough alloys. They quickly de-bur welded and punched holes and enlarge existing holes. Used widely for light steel erection, automotive frame work, truck and trailer and farm machinery. Heat Treated, High Carbon Steel T-handle design makes turning easy Ream, align and enlarge holes 1/8" to 1/2" & 5/32" to 7/8"
INCLUDES: (1) Maintenance ReamerFEATURES: High speed steel Left hand helix Right hand cut Flatted round shank Collar stop De-bur holes Enlarge existing holesSPECIFICATIONS: Size: 1/2" Decimal equivalent: .5000 Point diameter: .230 Flute length: 3-15/16" Overall length: 5-15/16" Recommended for light steel erection, automotive frame work, truck and trailer and farm machinery.Champion's SA80 Maintenance Reamers are the ideal maintenance and repair tool that cuts steel, stainless steel, and tough alloys. They quickly de-bur welded and punched holes and enlarge existing holes. Used widely for light steel erection, automotive frame work, truck and trailer and farm machinery. SE is proud to bring you our 10-Piece Diamond-Coated Tapered Bead Reamer Set. Use this quality set of reamers to easily take off fine flashing from your soft to semi-soft materials, which may include (but are not limited to) beads, glass, ceramic, stone, wood, vinyl, grommet materials, and so much more! SE products are quality items for extremely reasonable prices. SE is committed to providing the customer with the best source for value possible on the market. 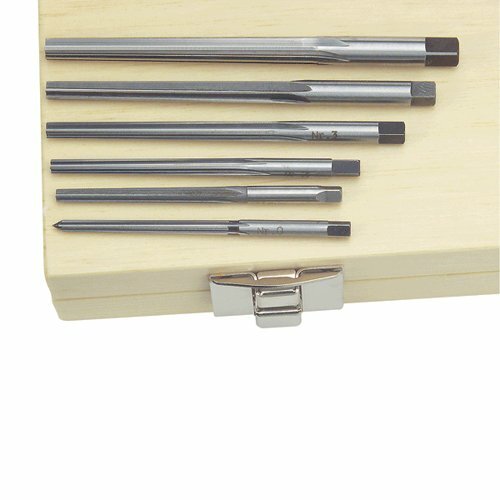 You will enjoy the quality, function and usefulness this 10-Piece Diamond-Coated Tapered Bead Reamer Set has to offer. INCLUDES: (1) Maintenance ReamerFEATURES: High speed steel Left hand helix Right hand cut Flatted round shank Collar stop De-bur holes Enlarge existing holesSPECIFICATIONS: Size: 3/8" Decimal equivalent: .3750 Point diameter: .188 Flute length: 3" Overall length: 5" Recommended for light steel erection, automotive frame work, truck and trailer and farm machinery.Champion's SA80 Maintenance Reamers are the ideal maintenance and repair tool that cuts steel, stainless steel, and tough alloys. They quickly de-bur welded and punched holes and enlarge existing holes. Used widely for light steel erection, automotive frame work, truck and trailer and farm machinery. 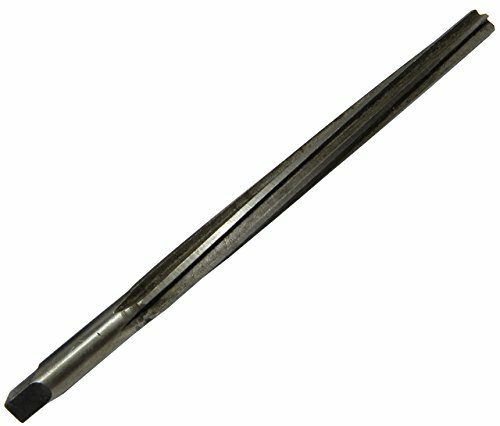 TTC High Speed Steel Construction Taper Reamers - Overall Length : 7-1/4" Shank Length : 1-1/2" Size : 13/16", 0.8155"
Straight shank with stop collar to prevent the reamer running through the hole. Works well in free cutting and carbon steels, as well as soft, non-ferrous materials such as aluminum, brass and copper. Left hand spiral push chips forward and are ideal for through-hole applications. 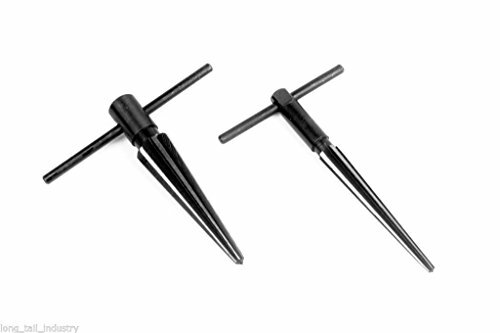 Construction taper reamers used to align holes prior to bolt or rivet installations. Safety flange prevents tool run through. Increased taper for ease in hole entry. Fast helix for better finishes. Design provides the finest hole finish. INCLUDES: (1) Maintenance ReamerFEATURES: High speed steel Left hand helix Right hand cut Flatted round shank Collar stop De-bur holes Enlarge existing holesSPECIFICATIONS: Size: 1" Decimal equivalent: 1.000 Point diameter: .708 Flute length: 5-3/16" Overall length: 7-1/4" Recommended for light steel erection, automotive frame work, truck and trailer and farm machinery.Champion's SA80 Maintenance Reamers are the ideal maintenance and repair tool that cuts steel, stainless steel, and tough alloys. They quickly de-bur welded and punched holes and enlarge existing holes. Used widely for light steel erection, automotive frame work, truck and trailer and farm machinery. Champion Cutting Tool SA80-1-1/4 Maintenance Reamers 3/4" Flatted Shank. Narrow Point Enables the Reamer to Fit into Small Holes. Five Cutting Edges Yield Quick and Efficient Results. Enlarge and Align Holes in Structural Steel, Including Stainless Steel and Tough Alloys. Recommended for Use in Truck & Trailer Manufacturing, Maintenance, Automotive and Repair. 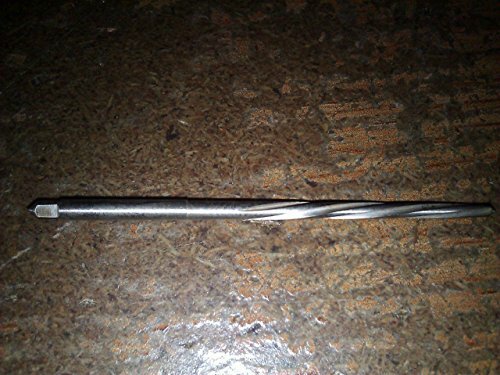 Drill America DWRRTP series Qualtech High-Speed Steel taper pin reamer. This tapered reamer turns a straight hole into a tapered hole into which standard taper pins will fit. The straight-flute reamers are generally used by hand while the helical-flute is designed for machine use. The square on the shanks of the straight fluted are suitable for holding in a tap wrench or vise. This reamer is recommended for most materials. 0.3297-inches short end and 0.422-inches large end. 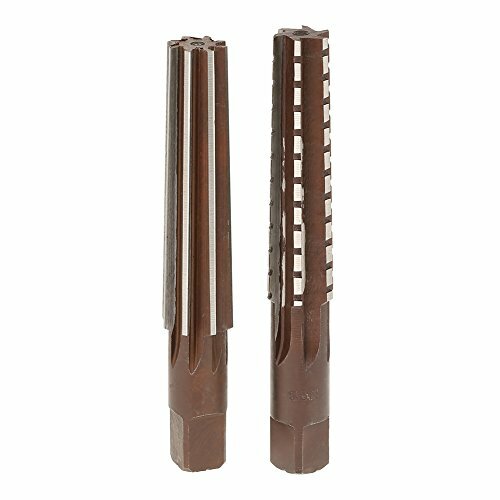 Straight flute reamers suitable for taper reaming operations while spiral flute type are better suited for operations involving interrupted cuts, such as reaming holes with keyways. For resizing of drilled and bored holes to suit standard tapered pins. Use in a variety of normal ferrous, non-ferrous and non-metallic materials. Allstar 1-1/2 inch Taper 7.15 Degree Taper Reamer with T-Handle has a t-handle with a 7.15 degree taper and has 1-1/2 inches of taper per foot. It allows the user to repair or enlarge tapered holes to accept tie rod ends or ball joints. It may also be used in a drill with a 1/2 inch chuck by removing the t-handle. It is backed by a 90-day limited factory warranty and sold individually. May also be used in a drill with a 1/2 inch chuck by removing the t-handle. Drill America DWRRTPS series Qualtech High-Speed Steel taper pin reamer. This tapered reamer turns a straight hole into a tapered hole into which standard taper pins will fit. The straight-flute reamers are generally used by hand while the helical-flute is designed for machine use. The square on the shanks of the straight fluted are suitable for holding in a tap wrench or vise. 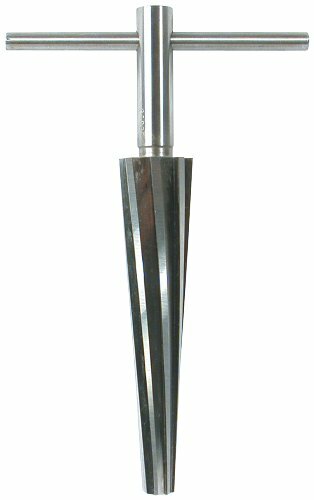 The spiral flute taper pin reamer is recommended for applications where the reamer tends to wedge itself. 1.009-inches short end and 1.259-inches large end. Drill America DWRRTPS series Qualtech High-Speed Steel taper pin reamer. This tapered reamer turns a straight hole into a tapered hole into which standard taper pins will fit. The straight-flute reamers are generally used by hand while the helical-flute is designed for machine use. The square on the shanks of the straight fluted are suitable for holding in a tap wrench or vise. 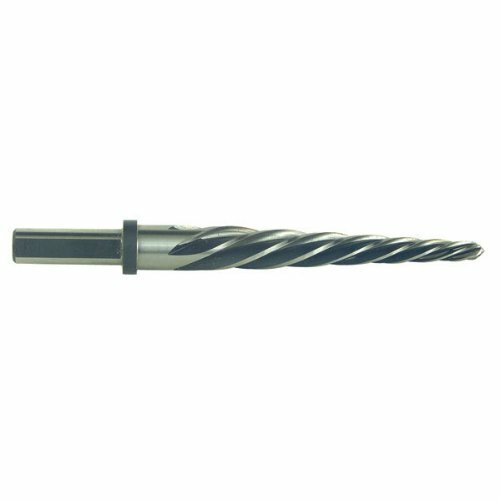 The spiral flute taper pin reamer is recommended for applications where the reamer tends to wedge itself. 0.4805-inches short end and 0.6066-inches large end.